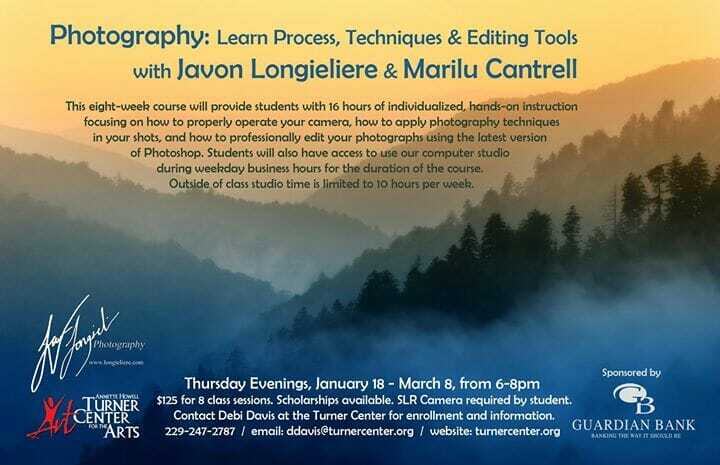 This eight-week course will provide students with 16 hours of individualized, hands-on instruction focusing on how to properly operate your camera, how to apply photography techniques in your shots, and how to professionally edit your photographs using the latest version of Photoshop. Students will also have access top use our computer studio during weekday business hours for the duration of the course. Outside of class studio time is limited to 10 hours per week. Thursday evenings, January 18-March 8, from 6-8pm. $125 for 8 class sessions. Scholarships available. SLR camera required by student. Contact Debi Davis at the Turner Center for enrollment and information.